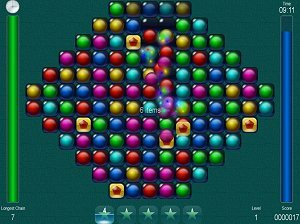 Bubble Chains is another match 3 puzzle game from the maker of Jag, and also freeware and open source. The player has to clean the board by combining 3 or more colored bubbles before time runs out. Tools provide different abilities, such as adding more time or destroying some bubbles.